Multiple research studies have shown that using a RMT (Respiratory Muscle Training ) device, with the addition of a fitness regiment such as walking, improves the strength and endurance of the respiratory muscles. These products are intended for anyone who wishes to improve the strength and endurance of his or her respiratory muscles. Professional athletes, recreational athletes and healthy individuals will all benefit from respiratory training. 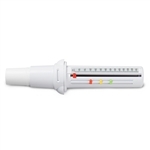 Concord Health Supply is trusted supplies of pulse oximeters in addition to blood pressure monitors. Check out our whole selection of health care supplies such as gloves, antiseptic towelettes and oximeter accessories. A family owned business, our primary effort is to provide exceptional customer service and 100% satisfaction guarantee. That is why we offer easy exchange or return policy within 30 days of purchase in case you are not happy with your purchase. To learn more about our products or get answer to your question, you can also call us at 1-888-970-2999. You also get free shipping in the US on our products.